When I first moved to China it wasn’t long before I discovered Tom Beeke’s excellent BirdForum thread about his sightings in and around Dalian, located in China’s northeast Liaoning Province. Tom’s superb sightings, enthusiastically documented for all to see, were a big inspiration to me. 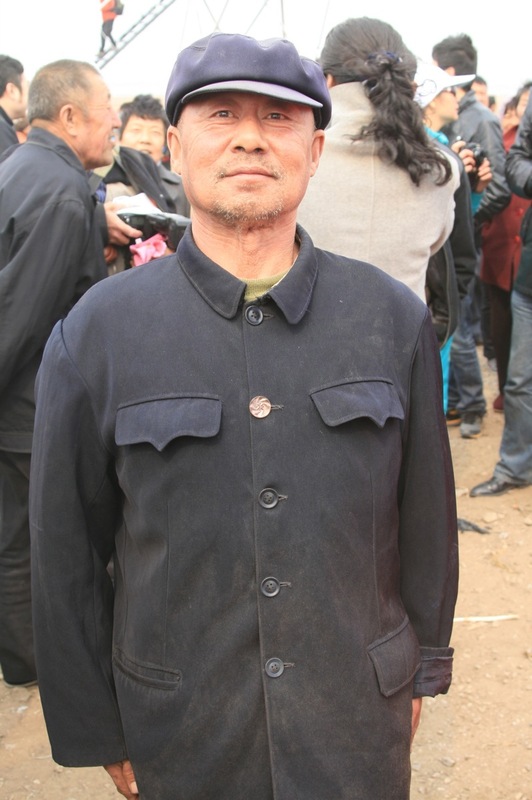 As a teacher at the Maple Leaf School in Jinshitan, he developed groundbreaking environmental education classes for his students and, somehow, found the time to write a bird book. “The Birds of Dalian” was first published in 2010 and the 2nd edition, in both English and Chinese, is now available, thanks to the support of Swarovski Optik and Zhu Lei for the Chinese translation. The book covers 326 species and includes Tom’s photos of the various plumages of each species. Hear hear, Tom. To read more about the book, and to purchase a copy for only 150 Chinese Yuan (under GBP 20), follow this link. Thoroughly recommended! September and October are probably my favourite months in Beijing. The excessive heat of the summer diminishes and, given the autumnal breeze, combined with regular rain, the air quality is good, resulting in some fantastic clear days with superb visibility. It’s a reminder that Beijing is a beautiful city and if ever an extra incentive was needed to clean up the capital’s air, being outside on autumnal days and seeing the mountains, with the ever-impressive Great Wall running along the spine of the northern ranges, must be it. Of course September and October are also superb months for birding with migration in full swing. Taking advantage of Dalian-based Tom Beeke’s presence in the capital for an ice-hockey tournament, Paul Holt and I took Tom for a day’s birding at Miyun Reservoir on Sunday. And what a beautiful day it was. With the temperature a fresh 14 degrees C early on (rising to 32 degrees C later), a stunning clear blue sky and visibility of at least 30-40km, it was a great day to be in the field. We visited three sites around the reservoir and recorded an impressive 91 species, including two new birds for me in Beijing – LITTLE CURLEW (小杓鹬) and RUSSET SPARROW (山麻雀) – plus 2 SHORT-TOED EAGLES (短趾雕), several PIED HARRIERS (鹊鹞) and, best of all, a PEREGRINE (游隼) of the subspecies peregrinator – a resident of India, Pakistan, Sri Lanka and southern China. We believe this is the first record of this subspecies in Beijing and the most northerly record in China – unless you know better? Some images from the day and a full species list (courtesy of Paul Holt) below. One of two Short-toed Eagles seen at Miyun on 1 September. This species is a regular passage migrant in Spring and Autumn in Beijing. Little Curlew, Miyun Reservoir, 1 September 2013. This bird made two great fly-bys, calling frequently. Peregrine of the subspecies peregrinator. Note the rufous underparts contrasting with the pale throat and upper breast. In the field this bird was small and sported a very dark cap, all features consistent with this southern subspecies. 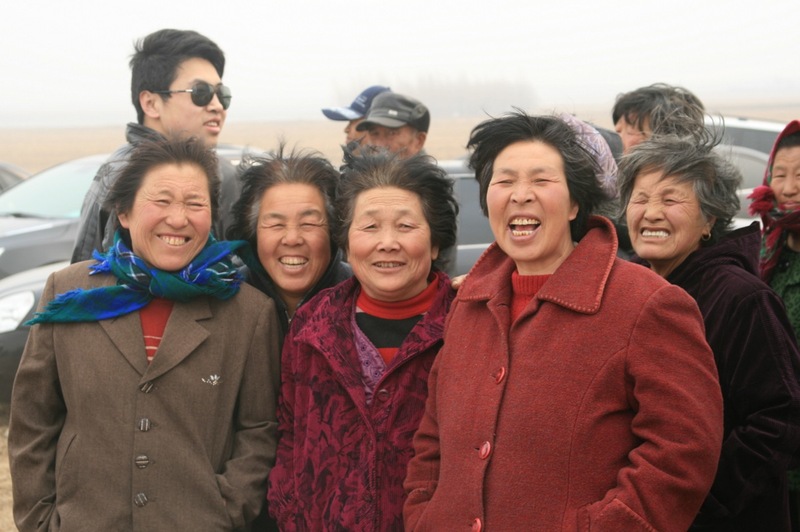 The first record for Beijing and, probably, the most northerly record in China. 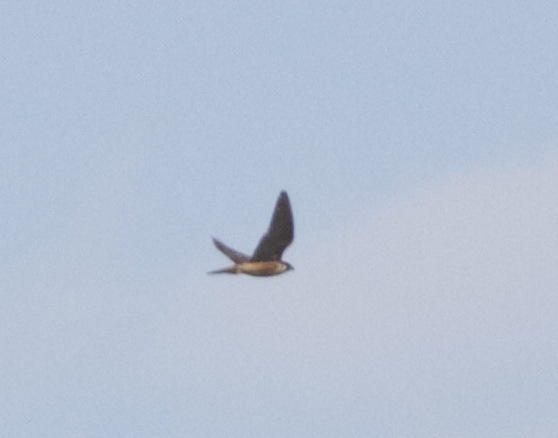 Another image of the “peregrinator” Peregrine. Photo by Tom Beeke. Falcated Duck – 4, including an eclipse adult male, at Miyun reservoir. Apparently the earliest autumn records from Beijing. The previous earliest were 25 and 36 birds at Miyun reservoir on the 11 and 12 September 2004 respectively (PH pers. obs.). These dates seem unusually late however and it’s likely that limited observer coverage of Miyun reservoir & WDL in late August is responsible as birds are regularly encountered on the Hebei and Tianjin coasts at that time. Black Stork – 3 flew north over the Jingcheng expressway near Miyun town (kilometre post 62) at about 05h45. Osprey – 1. Probably the earliest autumn date for Beijing. Crested (Oriental) Honey-buzzard – 1 flew south high over in the Yongle cun, Miyun reservoir. 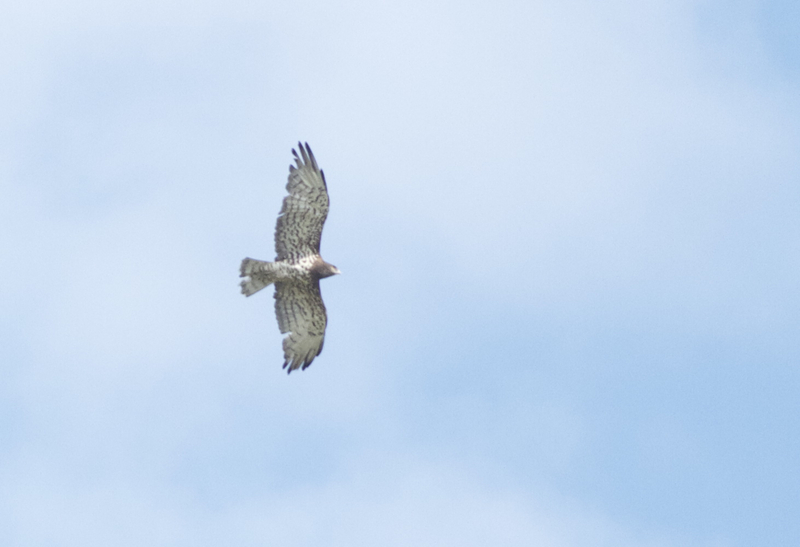 Short-toed Snake Eagle – 2. Both were photographed. 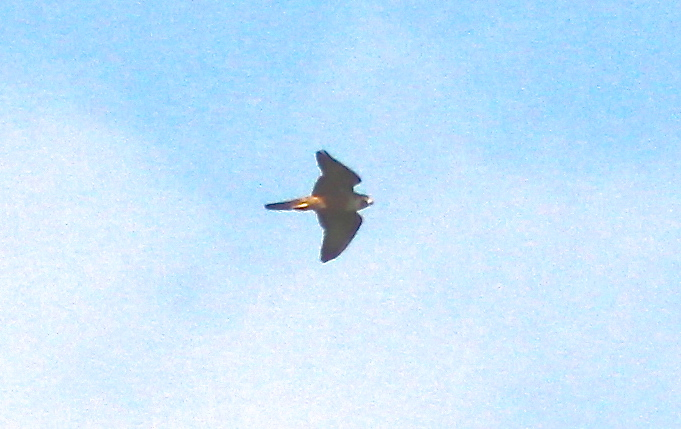 Peregrine Falcon – 2 juveniles near Yongle cun, Miyun reservoir on the 1/9/2013. The first bird that we saw was a ‘Shaheen’ Falcon Falco peregrinus peregrinator as it was slightly small and compact, even for a male, had a strong rufous suffusion to its lower underparts and underwing coverts that contrasted well with its whiter breast and cheeks. It was quite dark above with rather little contrast with the paler rump and had an extensive dark hood. In China peregrinator is a bird of the south and can be found, albeit locally, in Sichuan. 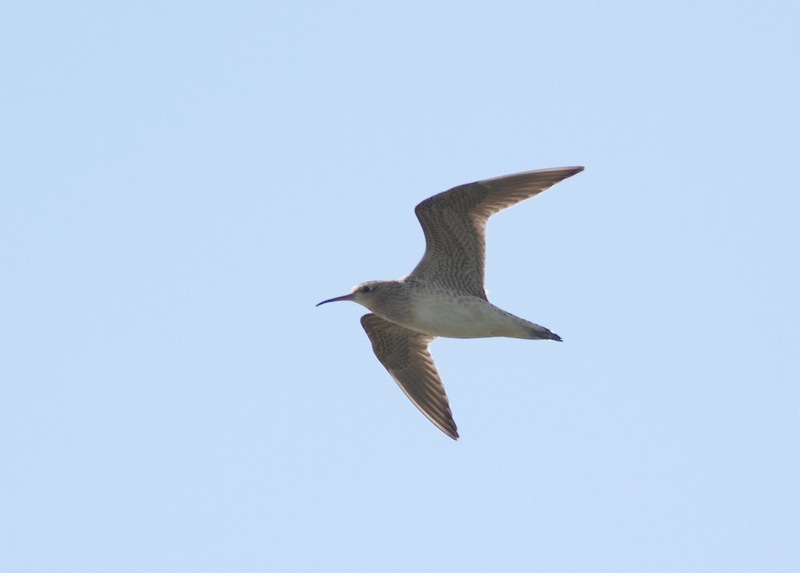 The most northerly record in China until today had been an adult at Yangxian, Shaanxi on the 1 July 2013 (PH pers. obs.). Gull-billed Tern – 4, two adults and two first-winters. One of only five autumn records from Beijing! Common Tern – 3 adults. Two were minusensis & the other longipennis. Asian Koel – 1 singing bird was heard near Yongle cun, Miyun reservoir on the 1/9/2013. 2013 has been a record year for this species in Beijing – and today’s was the first ever September encounter. Barn Swallow – 35 around Miyun reservoir. Five of these, including one tytleri, were near Yongle cun with the other 30 in & around Hou Ba Jia Zhuang village. Russet Sparrow – 17 in a mixed flock with Eurasian Tree Sparrows near Yongle cun, Miyun reservoir. One of very few double-figure day counts from Beijing and perhaps the first record for Miyun county? The number of Russet Sparrows being reported in Beijing appears to have declined in recent years (from high counts that included 50 at the Jumahe, Fangshan on the 4/12/2004 [QYX in 2004 CBR], 30 at Shidu, Fangshan on 30/12/2007 (蛐蛐儿黑鹳辛夷拙石 via BirdTalker) and 20 at Juili cun, Jiuduhe zhen, Huairou on the 11/9/2010 [dianchi via BirdTalker]). Note that Beijing has been the northern limit of this species’ Chinese breeding range for over a decade – this is despite recent records at Laotie Shan, Liaoning in May 2011 (Townshend and Millington 2011) & May 2013 (Terry Townshend pers. comm to PH) and on the Hebei coast suggest that the species is continuing to slowly expand its range. Red-throated Pipit – 1. Apparently the joint earliest autumn record from Beijing – equalling the sighting of five at Shahe Reservoir, Changping on 1/9/2008 (红嘴蓝鹊, 鹰之舞 via BirdTalker). Common Rosefinch – 112. 17 of these were near Yongle cun with the other 95, including a single flock of about 80 birds, were near Hou Ba Jia Zhuang. Apparently a record autumn count for Beijing. 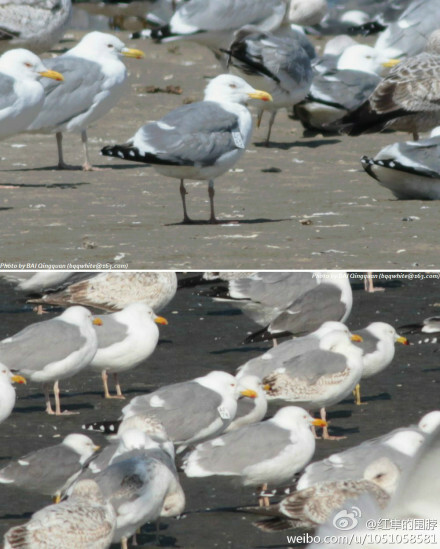 Mongolian Gull (Larus mongolicus) with wing-tag “AC82” (top), Jinzhou Bay, Dalian, March 2013. A “right old bird” at almost 24 years old… Photograph by Bai Qingquan. 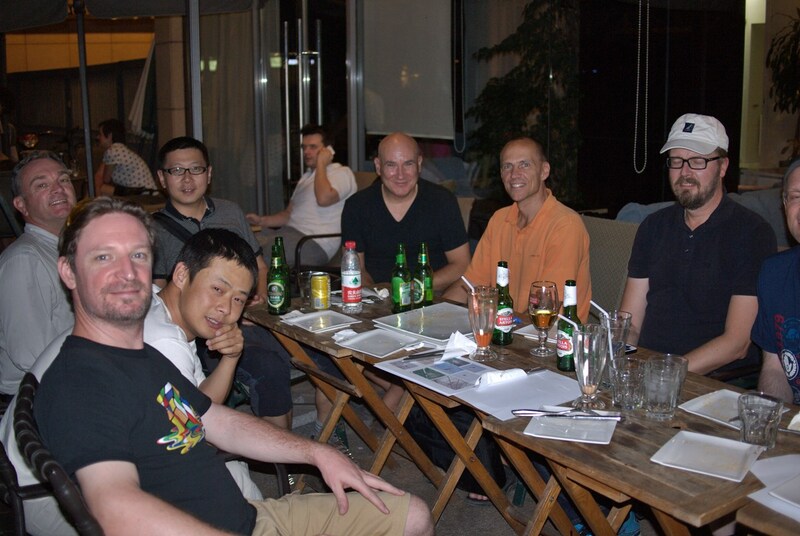 Not long after I arrived in China, I visited Liaoning Province to see my good friend, Dalian-based Tom Beeke. He very kindly showed me some of his local birding sites, including what must be the best gull-watching site in north-eastern China, Jinzhou Bay. Attracted by the nearby landfill site, thousands of gulls congregate in the area to spend the winter. Most are Mongolian Gulls but there is always a good selection with Vega Gull, Heuglin’s Gull, Common Gull, Black-tailed Gull, Black-headed Gull and occasionally something rarer like a Glaucous Gull, Slaty-backed Gull or, as I was lucky enough to see on my first visit, a Pallas’s Gull. Before I visited, friend and co-author of the excellent Birding Mongolia blog, Andreas Buchheim, asked me to look out for wing-tagged Mongolian Gulls and, sure enough, among the large flocks of Mongolian Gull loafing on the ice in the bay, I was able to pick out several wing-tagged birds. These birds had been tagged by Andreas at various sites in Mongolia and Russia and showed that these birds, as expected, moved to the east coast of Asia in winter. This site was so good that I went back in winter 2011/12 with Beijing-based Paul Holt, during which time we found several more wing-tagged Mongolian Gulls. I haven’t been able to visit Jinzhou Bay this winter but another good friend, and fellow birder, Bai Qingquan from Dandong, visited there on 23 and 24 March. Qingquan estimated that there were around 6,000 gulls of 7 different species on site. Excitingly, he found two wing-tagged gulls that I had seen, together with Paul Holt, in winter 2011/12. Another of Qingquan’s sightings was of “AF63”. I saw this bird at the same site in February 2011 and Paul Holt and I saw it again in January 2012, showing that at least some of these gulls are site-faithful in winter.. again, another valuable piece of data. I simply love the information that can be gained through tagging programmes like this. Looking for marked birds adds another dimension to birding and it’s so rewarding to hear back from the project leaders about the history of individual birds. I urge every birder to look out for, and report, any wing-tagged, colour-ringed or any other birds marked in any way. For more information about Andreas Buccheim’s Mongolian Gull wing-tagging programme, see here. For information about how to report a wing-tagged or colour-ringed bird, see here for Europe and here for Asia. Last week, together with Tom Beeke in Dalian and Tian Yang (Leyton), a Dalian-based birding friend, I received an invitation to participate in the International Siberian Crane Festival in Faku County, near Shenyang in Liaoning Province. The invitation came from Professor Zhou from Shenyang University who we had both met last autumn whilst watching waders along the Liaoning coast. Apparently my sighting of 3 Siberian Cranes in Beijing in March (the second record for the capital) qualified me as a Siberian Crane expert…. 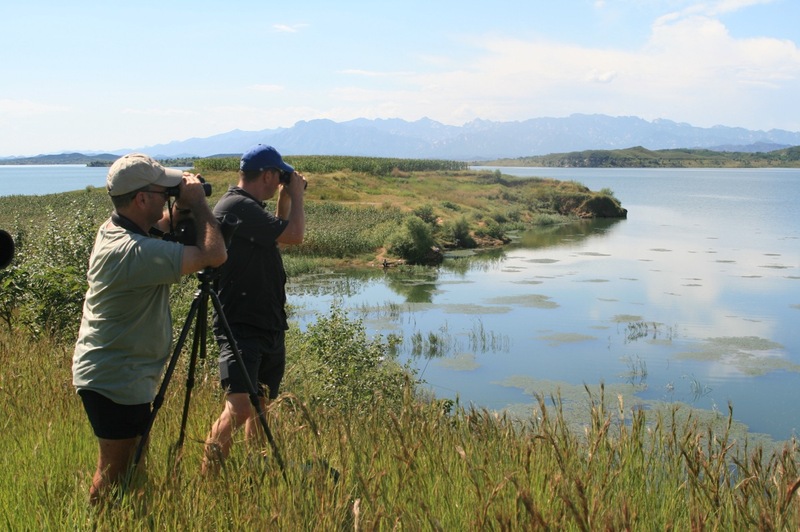 Faku County hosts a network of 16 freshwater lakes which, together, form a very important stopover site for a host of wildfowl and, in particular, the ‘critically endangered’ Siberian Crane. The world population of this species is thought to be around 3,000 individuals and declining. About ten days ago, 2,000 were counted at this important site. The day before our visit on Tuesday, 821 were seen. Clearly, this is a hugely important site for the Siberian Crane but it is not currently included in the list of priority sites for this species in China (so far, five wetland sites have been identified as critical, including the Poyang Lake Basin, where up to 98% of the world’s population of Siberian Cranes over-winter; the other four sites are national level nature reserves – Zhalong, Xianghai, Keerqin, and Momoge Nature Reserves – that protect important migratory habitat used by the Siberian Crane in northeastern China). 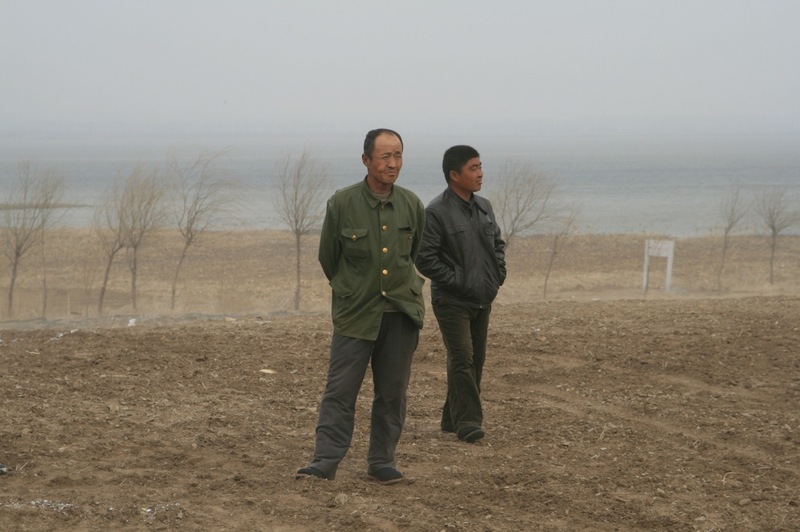 As is often the case in rapidly developing China, the site is under threat. To help raise awareness, Professor Zhou set up an International Siberian Crane Festival and invited the most important local politicians, decision-makers and local people to attend. The deputy Mayor of Shenyang, the Party Secretary of Faku County and his deputy all participated. Professor Zhou also invited a panel of experts from Beijing including the China head of Wetlands International and a Deputy Director from the Forestry Ministry. 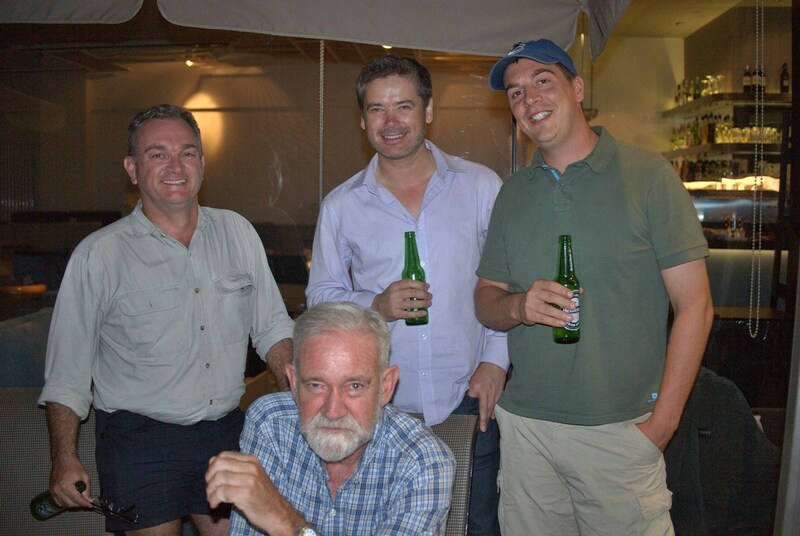 Tom and I were invited to provide an international perspective. Our day began at 0500 with a visit to the site to do a spot of birdwatching before the official proceedings began. Unfortunately, due to a delay in leaving the hotel (too much baijio for some?) we missed the main crane post-roost flight but, luckily (for Tom at least as he had never seen Siberian Crane! ), a couple of stragglers remained and we were able to watch them feed, albeit at distance. We also saw good numbers of Greater White-fronted Geese, some Swan Geese, Bean Geese, Baikal Teal and Grey-headed Lapwing. 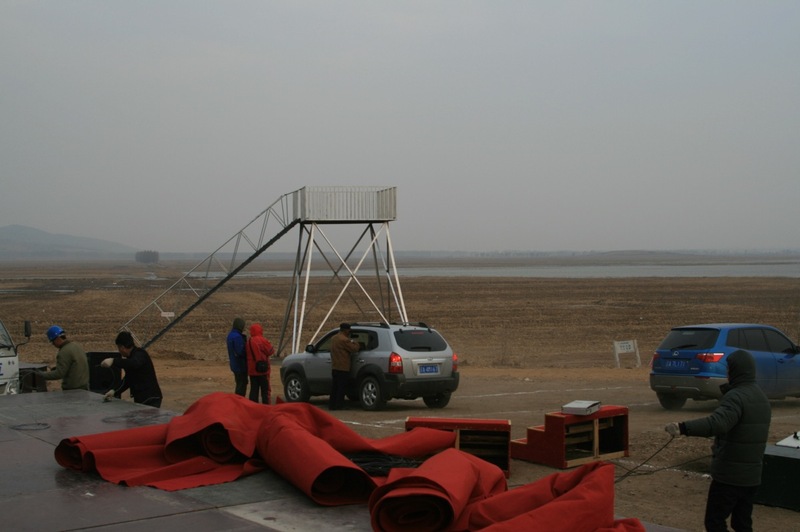 After a tour of the main reservoir we were driven to a raised viewing area which was being prepared for the festival. 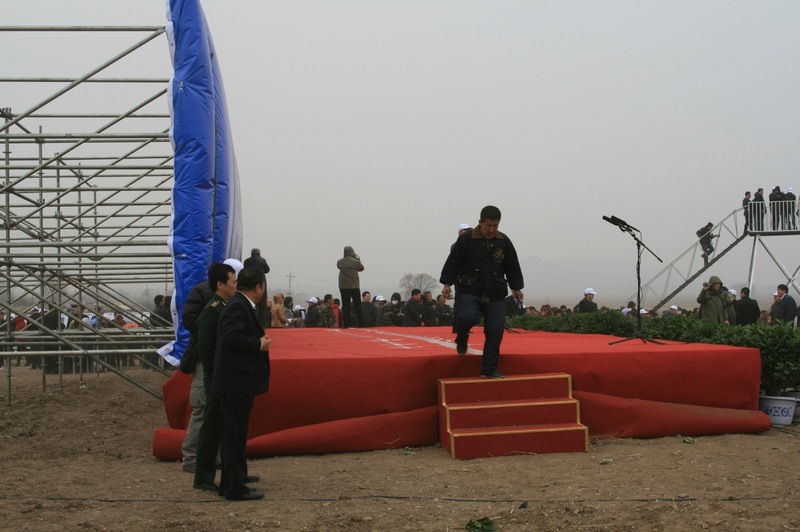 The festival began at 0930 with a formal opening ceremony at the wetland itself which, despite the weather (strong winds and dust storms) saw a hugely impressive local turnout. 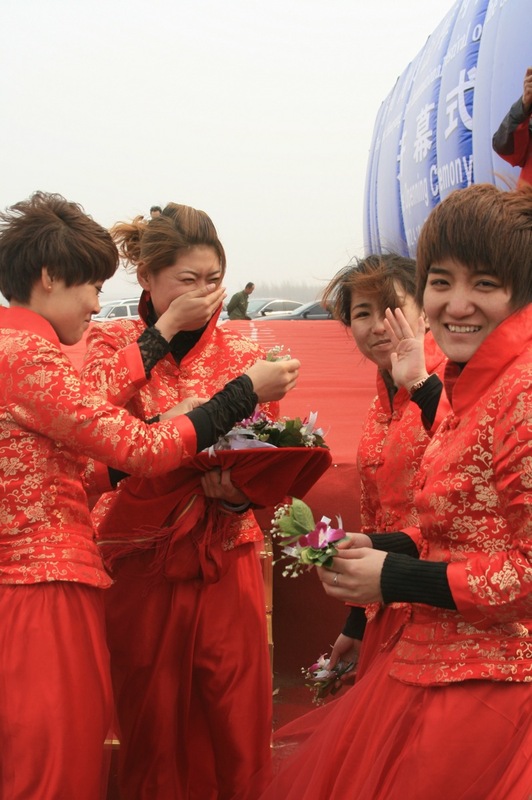 It appeared to be the biggest event to happen in this community for a long time with hundreds of local people present. The police were there in numbers to coordinate the crowds. Some of the local women enjoying the opening ceremony..
As the time for the opening ceremony approached, the crowd began to build. The police took time out from their crowd control duties to check out Professor Zhou's photos on the display boards. After the formal opening ceremony, during which Tom and I were asked to stand on the stage (!) while 4 dignitaries spoke, we were driven to the local government offices where we participated in a roundtable workshop with the Party chiefs, local residents and media. 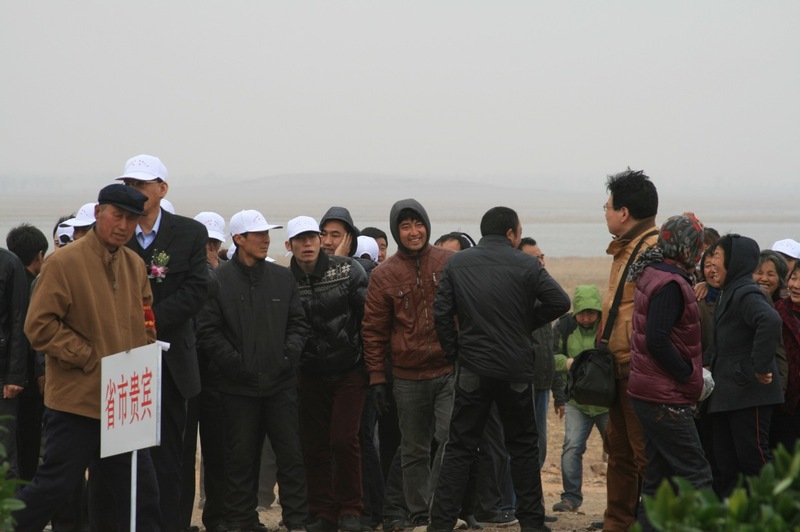 The workshop began with presentations by Wetlands International, the Forestry Ministry and Professor Zhou, all aimed at explaining the significance of this site and the potential for the local area to achieve provincial, national and international recognition (via Ramsar status) and to secure associated financing. Tom and I were then invited to provide international perspectives and we both spoke about the potential economic value of eco-tourism, the importance of valuing natural capital in economic decision-making, including the ecosystem services provided by wetlands, and the experience of our respective countries in terms of wildlife tourism. It was heartening to hear the Party Secretary (the top official in Faku County) promise, at the end of the event, to review the County’s development strategy on the basis of what he had heard and he even invited us to be formal advisers to his County (one for the CV!). After some interviews with the media (including Liaoning TV and Radio, CCTV, Tianjin News and others), we were provided with an official lunch with the obligatory toasts of the local baijio before heading back home. Tom and I were both very grateful for the warmth of the welcome we received and the memory of this event, and our visit to Faku, will stay with us for a very long time. A big thank you to Leyton for his interpretation service. 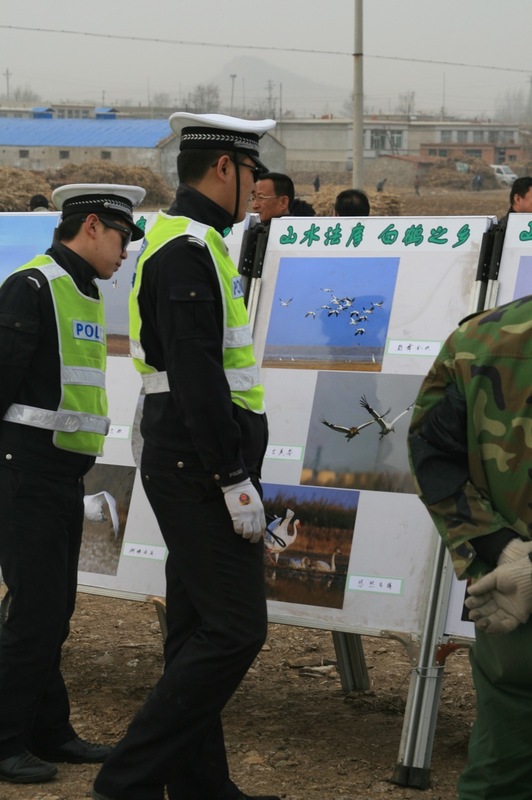 Professor Zhou is to be congratulated: he is clearly working extremely hard to try to protect this area and is making every effort to persuade the local Party chiefs that it is in their long term interest to secure the future of these wetlands and the birds that depend on them. I would like to wish him every success and, in my new capacity as environmental advisor to Faku County, I stand ready to assist in any way I can! By the way, did you know that the oldest documented crane that ever lived was a Siberian Crane named “Wolf”, who died at the age of 83? Amazing!